In the latest instalment of articles explaining the fundamentals of BIM, Stefan Mordue, co-author of BIM for Dummies and a technical author at NBS, talks us through Level 0, 1, 2 and 3 BIM. Answer the question at the bottom of the article to be entered into a draw to win a copy of BIM for Dummies. 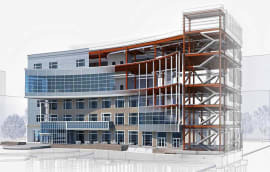 BIM means different things to different people, and nailing down a consistent definition is perhaps near on impossible. From the outset, the UK government adopted a “push-pull” strategy, when it came to BIM adoption. 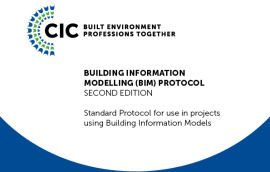 It was recommended by the BIM Working Group in a report to the Government Construction Client Group in 2011 that over the next five years it would support the “push” supply side of the industry to enable all players to reach a minimum performance in the area of BIM (now known as Level 2) by providing standards, guides and training that would support a simple delivery. This would be balanced by a “pull” from the client side to specify, collect and use the derived information in a value adding way over a similar timescale. The aim was for the client to be very specific about what information it was asking of the supply chain and when that information is to be delivered. This wasn’t to happen all over night and plans were put into place which would allow for a gradual adoption in small (but significant) progressive steps. It was acknowledged that both the client and supply chain would require time to allow for technology, training, legal and cultural changes to be effectively both communicated and adopted. Another key decision in the development of the UK BIM strategy was to focus on end deliverables and who would be responsible for these, making sure that contractual requirements were specific. It was hoped that this would help when information is to be delivered collectively from across the supply chain. Within any industry there will always be the early adopters and trail blazers. However, it was recommended that the trailing edge be given help and clear targets, and from this the recommended target for all central procurement government projects was BIM Level 2. Perhaps no BIM presentation is complete without an image of the UK maturity model (pictured above), developed by Mark Bew and Mervyn Richards. Instantly recognisable by its wedge shape, it has been a useful diagram for the supply chain to identify what it is to deliver and the competences required while the client can understand what the supply chain is offering. In essence it is all about communicating expectations. For anyone new to BIM it can be easy to get your 2D, 3D, 4D and 5Ds mixed up with your BIM Levels 0, 1, 2 and 3. By defining levels of maturity, organisations can set a benchmark as to where they currently are. Level 0 is defined as unmanaged CAD. 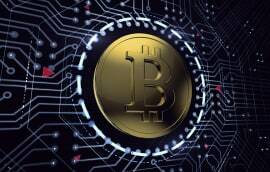 This is likely to be 2D, with information being shared by traditional paper drawings or in some instances, digitally via PDF, essentially separate sources of information covering basic asset information. Level 1 is a mix of 2D and 3D information using BS 1192 with a collaboration tool providing a Common Data Environment. 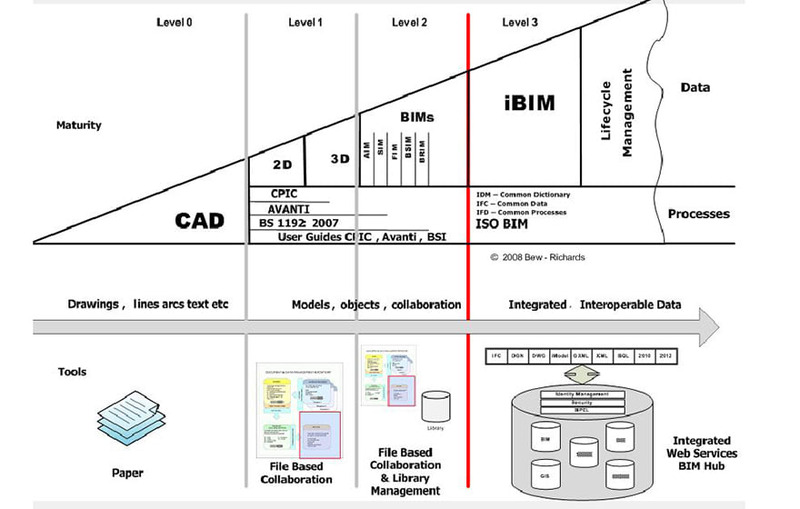 Level 2, which was mandated in April, is described as collaborative BIM. Federated model information is shared within a Common Data Environment. The new government website www.bim-level2.org provides a one-stop-shop access to the Level 2 standards including PAS 1192. The latest Government Construction Strategy, published in March 2016, seeks to embed BIM Level 2 across departments which will in turn “enable departments to gradually move to BIM Level 3”. While the industry currently gets to grips with Level 2, it may be seen as a bit premature to start talking about Level 3. However, the current Level 2 strategy has been five years in the making, and much preparation and planning was required. 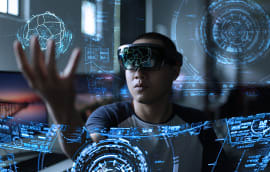 As the Digital Built Britain strategy rightly points out, while the opportunity is great, so too is the risk of not acting now and taking the opportunity to build upon the government’s existing programme, to capitalise on the UK’s global position. 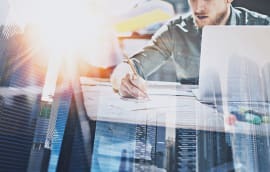 While Level 3 is unlikely to happen in the next five to 10 years, the wedge highlights that this is likely to be an “integrated” solution around open standards such as IFC with everyone working from a single model stored somewhere in a web service or cloud. This Digital Built Britain strategy is part of a much wider grand plan than just BIM, and will provide one consistent vision to how we create a high-performing, transparent economy that efficiently delivers services to all of its citizens by bringing together a number of other strategies including the Industrial Strategy – Construction 2025, the Business and Professional Services Strategy 22, the Smart Cities Strategy 23, and the Information Economy Strategy 24. This is perhaps reflected in the title, where the word “Digital” is used, rather than “BIM”. Level 3D Capitalising on world leadership. The Level 3 strategy is very much an aspirational and visionary document, with the exact detail to be developed in due course. Following the governments Budget in March 2016, a pledge was made to develop a new digital standard for construction, with the Department for Business, Innovation and Skills (BIS) announcing that £15m will be made available over the next three years for the development of Level 3. The problem I find with the wedge is it's out of date and needs ditching. Change the shape at the very least because I for one am fed up with seeing it. Leroy makes some good points in explaining how it works but this is old news! !